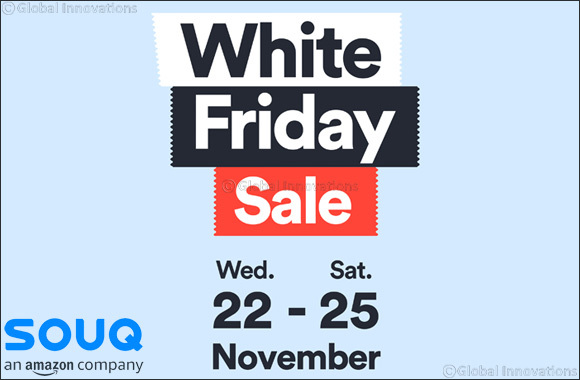 14 November 2017, Dubai, United Arab Emirates: SOUQ.com has announced the return of its biggest online shopping event, the annual “White Friday Sale”, with 500,000 deals across the region on more than 16,000 brands, from Wednesday 22nd to Saturday 25th November 2017. In its fourth year running, shoppers across the GCC and Egypt can snap up deals of up to 70 percent off on all product categories on SOUQ's website and mobile app, including mobiles, TVs, large appliances such as refrigerators and washing machines, cameras, diapers, detergents, fashion products, perfumes, make up, furniture, tools, toys, games, cameras and much more. SOUQ.com has updated its logo to highlight that it is 'an Amazon Company' as a further step in its integration with global e-commerce giant Amazon (AMZN) and as a further statement of its shared vision to prioritize the customer experience.